Bumps and falls are no match for this anti-spill travel mug, thanks to a unique lid. Even in the face of jostling in the car, on the train, or in your hand, drinks stay safely contained. And if the cup tilts over on a table, the lid snaps shut almost instantly—so you might suffer a splatter but not a big spill. “360-degree drinkability” lets you sip from anywhere around the lid while letting the coffee’s aroma waft out and enhance your drinking experience. Maximum Fluid Capacity: 16 fl. oz. This mug works well when it is full and not so well when it only has a bit of liquid left in it. Didn't keep coffee warm. Once opened you had to take the lid off to close it. Not worth it. It is a cheap piece of junk. Yes it keeps the coffee from spilling, but it does not keep the coffee close to warm. This anti-spill travel mug offers a better way to drink coffee (and other beverages), while keeping them safely in the cup. 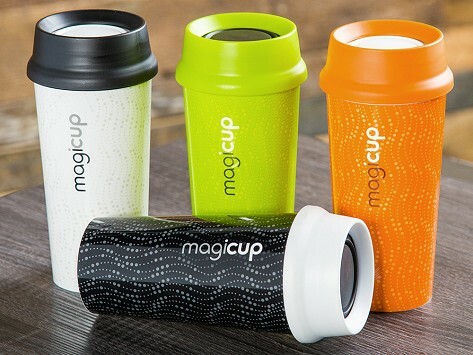 The magic of Magicup is its innovative lid. Your drink stays contained even if it’s bumped on the subway or jostled in the car. And the 360-degree drinking design lets you sip from anywhere around the lid. There’s no designated drinking hole—walk or drive without needing to look at the cup. If the cup gets knocked over, the lid’s center snaps shut almost instantly, preventing a major catastrophe. A splash may escape, but that’s it. Another benefit from the 360-degree lid is that it lets your coffee’s aroma reach your nose, heightening the flavor experience. The only thing we don’t recommend is tossing the cup in a bag. It isn’t designed for that kind of transport. But in your hands, on a table, or in the car, this cup cuts down on spills and creates a better way to enjoy your java.